The idea of travelling to Thailand conjures up many romantic and exotic images – from the frenetic streets of Bangkok, to gilded temples and giant Buddhas, to palm-fringed islands, and of course, elephants, Thailand's national symbol. All of these scenes in one way or another make the "Land of Smiles" a bucket list favorite for many, including our family. This summer, we visited Southeast Asia for three weeks, with most of our time spent in Thailand. One activity we did not do, however, was ride elephants – or attend shows where elephants danced, painted, or engaged in otherwise unelephant-like activities. As unfazed as this gentle giant may appear with a human sitting on its back, the distressing reality is that elephants who are tame enough to carry people have had to endure abusive training to behave that way. Call me a party-pooper for denying my children this so-called once-in-a-lifetime opportunity, but all it takes is a few minutes of research to uncover the inhumane tactics that are regularly used to prepare elephants for life as a tourist entertainer or circus performer. Once my kids learned the truth, they too had no interest in being part of this animal cruelty. Elephants in Thailand were once the workhorses of the logging industry, until logging was banned there in 1989. Out of a job and expensive to keep, many of these elephants literally ended up on the streets or in the tourist trade. Unlike the earlier mahouts, or elephant handlers, who grew up around these animals and inherited their profession, many handlers today have little knowledge about the nature and survival needs of elephants. They have themselves or families to support, and using elephants to entertain visitors is a reliable source of income. Who can blame them for wanting a slice of this lucrative market? The sad reality is that making an elephant people friendly and obedient requires an arduous training process called the "crush" that involves chaining the elephant to a confined pen, jabbing it constantly with a sharp instrument,and leaving the poor animal without food and water for days. The goal is to break the elephant's innate "wild" spirit so that it can be trained to do what its handlers want and what tourists like to see. 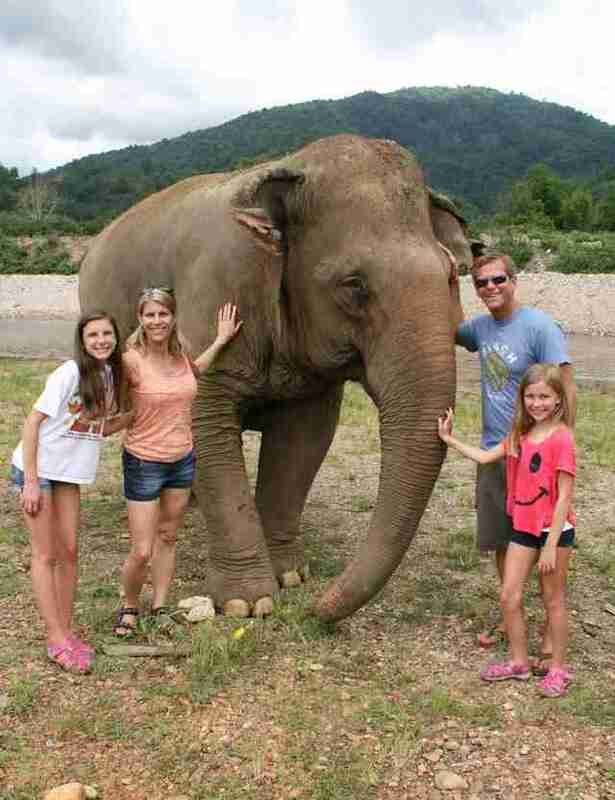 After reading more than I could bear about this gross mistreatment, I was determined to find a humane way for our family to see and interact with elephants. That meant no rides, no shows, no soccer balls, and no painting. 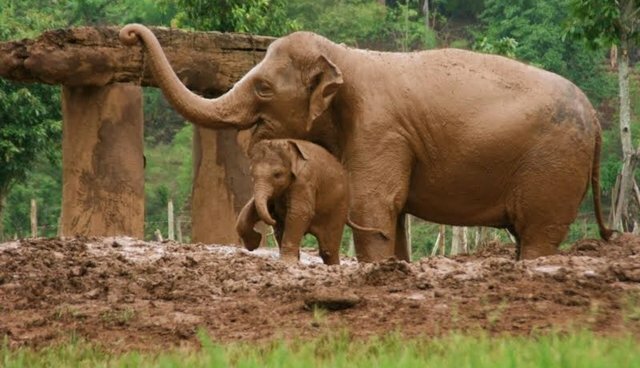 Months before our trip I enlisted my daughter to do some research, and within 10 minutes she came back with a place called the Elephant Nature Park (ENP) outside of Chiang Mai in the northern part of the country. It appeared to be the only place in Thailand that met my criteria. Based on the number of Facebook fans the park had (and that number grows everyday!) and the glowing reviews on Trip Advisor (also growing each day! ), I sensed that we had stumbled upon a very special place and immediately put a deposit down for a day-long visit in mid-June, early in the monsoon season. On the dayof our visit, staff picked us up at our hotel in Chiang Mai and drove us an hour and half into the jungle. The sun played peek-a-boo with a cluster of puffy clouds, and the air was damp with the hint of impending rain – just what I would have expected in the jungle. Reminiscent of Jurassic Park, ENP is set on a magnificent preserve of several hundred acres surrounded by lush mountains and a river in which the elephants love to bathe. There are about three dozen members of the herd – most are females, plus three adorable babies, who are constantly under the loving and protective watch of their mothers and the other females. With the exception of the babies, the elephants have been rescued from the tourist or logging industries, and many still suffer from injuries sustained during this experience. At ENP, they are now able to roam freely and live happily. Arriving in mid-morning, we were part of a group of about 10 people with a guide. Others were there as well for the two-day visit or as part of the longer-term volunteer program. Even though the park relies partly on entrance and volunteer fees to operate (both very reasonable, by the way), ENP limits the number of visitors.The park never felt over-crowded, and we had lots of time and space to explore. Our stay, which included a fabulous vegetarian lunch, lasted until about 4:30p.m., and during the day, we had the opportunity to feed, observe, touch, and bathe many of the elephants. My kids also enjoyed seeing – and in some cases, interacting with – the other animals that call ENP home. After the devastating 2011 floods in Bangkok, ENP's founder, Sangduen "Lek" Chaillert, rescued hundreds of dogs from Thailand's capital. They are now sheltered at ENP, mingling with the resident elephants, cats, and water buffalo. Growing up with elephants in the hills of northern Thailand, Lek developed a deep affection for elephants at an early age. Tiny in stature (Lek is actually the Thai word for "tiny"), but larger than life, she works tirelessly to put an end to widespread mistreatment of the animal her country supposedly reveres.Through ENP and other related projects, she educates tourists about the plight of Asian elephants, teaches local mahouts how to adopt more humane training methods, provides veterinary care for working pachyderms, and advocates for laws to give domesticated elephants the same protections as their wild cousins. Lek's work has been highlighted by National Geographic, the Discovery Channel, Animal Planet, and the BBC, and she herself has been honored with many awards, including being named one of the Six Women Heroes of Global Conservation by Hillary Clinton and the Ford Foundation's Hero of the Planet. Her Save Elephant Foundation helps local villages develop and implement sustainable business alternatives to elephant tourism. By tackling both the supply and demand sides of the industry, her efforts are quietly shifting the human-elephant dynamic from one of exploitation to one of respect. Our family's day at ENP was life-changing, and I'll be going back in 2015 to volunteer for a week. Never before had I been so close to an elephant; it was, in a word, magical. The elephants at ENP are allowed to do what elephants love to do – they roll in the mud, consume vast quantities of fruits and vegetables, and socialize with each other. Unlike an elephant show or a circus, the interaction with the animals at ENP is respectful, even humbling.